Kate Beckinsale Bares Midriff at Rolls Royce X Technogym Party! Kate Beckinsale shows off her bare midriff as she strikes a pose in two-piece vinyl ensemble while attending the Rolls Royce X Technogym Launch Celebration held at celebrity trainer Gunnar Peterson’s private residence on Thursday (August 30) in Beverly Hills, Calif. The 45-year-old actress was joined at the event by Elisabetta Canalis, Cleveland Cavaliers player Kevin Love and Survivor: Ghost Island contestant Michael Yerger as they celebrated the launch of the new Rolls Royce Cullinan SUV and Technogym’s Home Wellness Design. At the event guests tested out the digitally connected Technogym equipment from the brand’s PERSONAL line and SKILLINE, as well as preview the luxurious new Rolls Royce Cullinan. In case you missed it, check out Kate and Kathy Griffin‘s own spin on Drake‘s “In My Feelings” Challenge here! FYI: Kate is wearing a Meshki top and skirt. 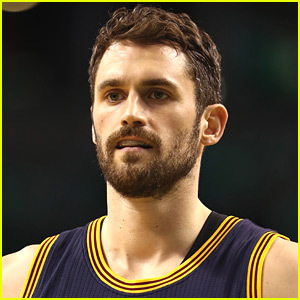 Cleveland Cavaliers player Kevin Love is opening up about suffering from a panic attack halfway through a recent basketball game. In an article titled “Everything is Going Through Something” published on The Players’ Tribune on Tuesday (March 6), the 29-year-old NBA player revealed that he had to leave the game back on November 5 after suffering from a panic attack. After being hospitalized and finding out he was fine physically, Kevin started seeing a therapist that has helped him acknowledge his feelings and struggles. You can read all of Kevin‘s article at ThePlayersTribune.com. Chadwick Boseman looked casual chic while attending the 2018 GQ All Star Party held at Nomad Los Angeles on Saturday night (February 17) in Los Angeles. 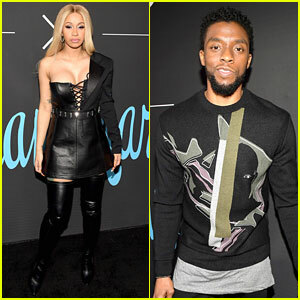 The 41-year-old Black Panther actor was joined at the event by Cardi B, Common, Dascha Polanco, AnnaLynne McCord, model Kate Bock with her basketball boyfriend Kevin Love, James Harden, Christian Combs, and Quincy Brown. Also in attendance were young singers Normani, who just dropped a brand new song and music video with Khalid, and Justine Skye. FYI: Justine wore a Bec + Bridge dress. Jessica Chastain, Katie Holmes & Nina Dobrev Attend Star-Studded Ralph Lauren Show! Jessica Chastain, Katie Holmes, and Nina Dobrev were just some of the celebs who stepped out to attend the Ralph Lauren Show during New York Fashion Week! The fashion presentation took place on Tuesday evening (September 12) in New York City. Guests also included Armie Hammer and wife Elizabeth Chambers, Diane Keaton, models Taylor Hill, Sistine Stallone, Romee Strijd, and Poppy Delevingne, and Kate Bock with boyfriend Kevin Love. In addition, Kendall Jenner and Bella Hadid walked the runway at the show – see those pics in case you missed them! Derek Jeter, Maria Sharapova & Michael Phelps Step Out for The Players' Tribune Night Out Bash! Derek Jeter is all smiles as he steps out for a rare night out at The Players’ Tribune Hosts Players’ Night Out 2017 held at The Beverly Hills Hotel on Tuesday (July 11) in Beverly Hills, Calif. 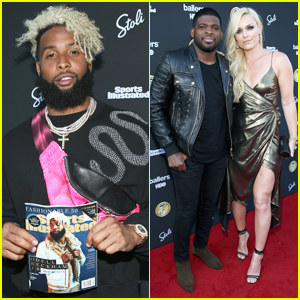 The 42-year-old retired NY Yankee star was joined at the event by Maria Sharapova, Olympic gold medalist Michael Phelps, former NBA star Lamar Odom, Kevin Durant, Kobe Bryant, Cleveland Cavaliers player Kevin Love and his girlfriend Kate Bock. Derek‘s last official appearance was at his ceremony to retire his jersey number with the New York Yankees at Yankee Stadium back in May. FYI: Kate is wearing an alice + olivia by Stacey Bendet dress.